Faith leaders from diverse traditions descended on the Holy City of Jerusalem on May 14, 2013 as part of the Middle East Peace Initiative (MEPI) and to honor the tenth anniversary of the “Jerusalem Declaration” for peace. Baptists, Pentecostals, Muslims and Buddhists – both clergy and some laypersons – flew in from Switzerland, Sweden, Germany, the Netherlands, Italy, and Austria, as well as Brazil, Suriname, and from a dozen cities in the United States – all eager to experience first-hand the spiritual treasures of this land, to learn, and to offer their prayers and voices for peace. Dr. Dawud Assad, a longtime MEPI participant, founding member and former Chairman of the U.S. Council of Mosques, as well as a Muslim cleric, emphasized at the orientation session on May 14th that he grew up in Jerusalem as a Palestinian, and he emphasized that as a boy his family had a Jewish family living with them. He has now lived in the United States for many years but emphasized that these interfaith programs have seriously helped the peace process. 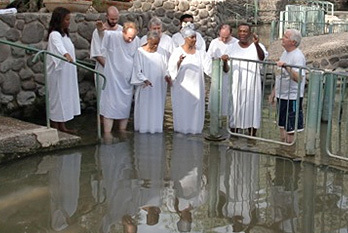 A group of clergy steps into the water of the Jordan on May 15, 2013, led by Bishop Jesse Edwards, co-chairman of the American Clergy Leadership Conference. 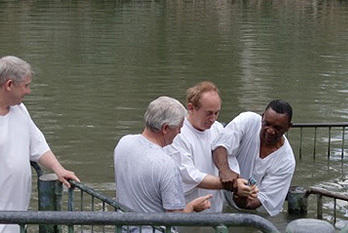 Doug Burton flanked by Bishop Jesse Edwards and Bishop Carlton Walters prepares to be immersed in the Jordan waters. Dr. Michael Jenkins, Chairman Emeritus of the American Clergy Leadership Conference, welcomed some 46 participants at the Hotel Dan and gave an overview of the mission of the upcoming four days. “This is not tourism: We call this a peace mission. We are going to the holy sites to pray for peace,” he said. He added: “Some people ask why we would want to meet in Jerusalem when there is such a danger of war breaking out in the area, but I say that’s why we have to be here. What we need is an optimistic attitude of faith. We are here celebrating the 10th Anniversary of the Jerusalem Declaration in which Jews, Muslims and Christians repented to God for the division of God’s people and for not having really understood one another. Faith leaders are responsible to demonstrate ways in which dialogue and understanding can reduce tensions and lead to cooperation toward peace. As Jewish scholar Shelly Elkayam has documented, since MEPI tours to Jerusalem, there has been a precipitous decline in violence over the last 10 years. Archbishop George Augustus Stallings, chairman of the ACLC began his remarks by revisiting the chant that the clergy uttered in 2003 as they marched arm in arm through the Old City: “Peace, Shalom, Salam al Lekum! Peace Shalom, Salam al Lekum, Pray for Peace in the Middle East.” “It is a very unifying song, when we as children of the Abrahamic faiths can come together, not only under God but in God. Because we are brothers and sisters,” he told the gathering. Archbishop Stallings went on to say: “In this place, that has been touched by the power and presence of faith, what is so fascinating, when you read the Bible and you visit this country, you realize how close the places are, how concentrated this region here. “It was the genius of Rev. Dr. Sun Myung Moon to bring gatherings here. He saw that it was incumbent to show the sensitivities of this area, that Palestinians don’t like to call it ‘Israel;’ that Israelis don’t like to call it ‘Palestine.’ For us as Christians, it was an eye opener to be reminded that Christianity wasn’t the only religion in the world. The beautiful thing about our work is the opportunity to put feet to our faith, to realize we are really from one blood,” the Archbishop said. The scholars and clergy gathered for prayer and preaching at 6:00 a.m. the next day, May 15, 2013, then boarded buses to visit the house where tradition holds that Mary, the mother of Jesus, received her revelation from the Archangel Gabriel. Dr. Vandy Kennedy of Capital Heights, Maryland led the group in prayer at the location, which is today within the Church of the Annunciation. The clergy then stopped to pray at the Mount of Beatitudes, where Jesus gave the Sermon on the Mount, and they visited the ruins of the village of Capernaum where Jesus lived and preached for the greater part of his public mission.